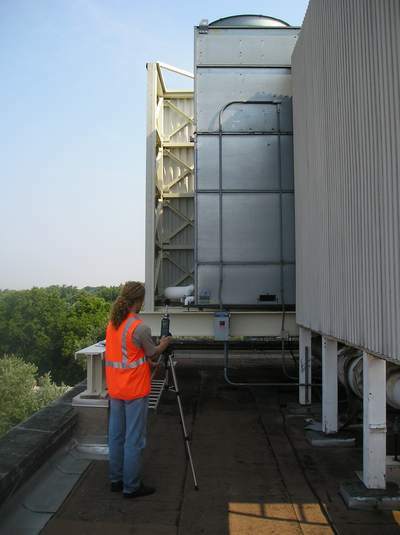 Code violations from noisy rooftop equipment at Suburban Hospital demanded a professional, permanent fix. Any mitigation would require a complex analysis of the equipment in question and its effect on multiple residential buildings next door. 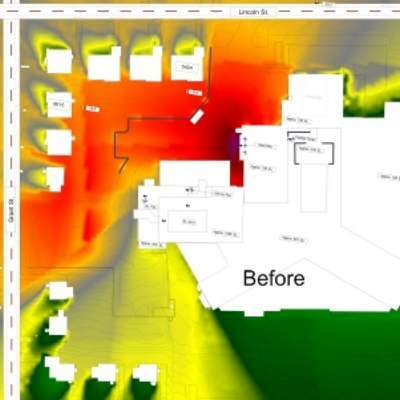 Accordingly, building managers needed a partner with the instrumentation, design software, and expertise to ensure the hospital’s compliance with the Montgomery County noise ordinance. Phoenix Noise and Vibration performed diagnostic surveys (see Figure 1) to pinpoint problem components on the roof. 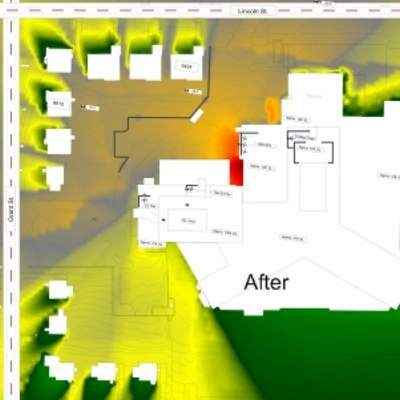 With our team’s comprehensive measurements in hand, we used DataKustik’s industry-leading CadnaA software to create a 3D model of the sound around the roof and several proposed noise barriers (see Figures 2 and 3), suggesting design improvements accordingly..
Post-construction tests recorded noise levels outside each of the neighboring residential buildings. At every location, our mitigation had dropped exterior sound levels well below the 55 dBA nighttime limit imposed by the Montgomery County noise ordinance.